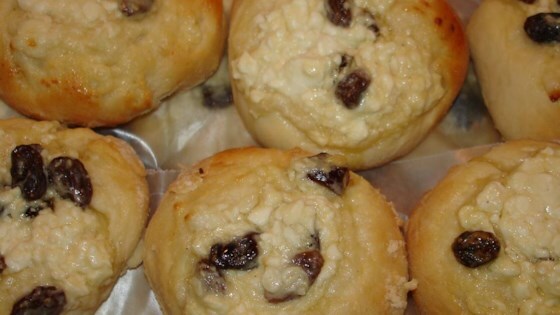 "This is a kolache recipe from the Czech Republic." Pour yeast into 1/2 cup of lukewarm water. Set aside to soak. In a separate bowl mix together 1 cup milk, 1/2 cup sugar, 1 teaspoon salt. Add 1/2 cup melted shortening and 2 cups sifted flour. Beat well. Add in 2 beaten eggs and yeast mixture and mix well. Set aside to rest until bubbly and spongy. Add 3 1/2 cups of flour and blend well. Set aside to rise for 1 hour. Punch down and let rise again for 1 hour. To Make Filling: Beat together 2 egg yolks, 3 tablespoons sugar, 1/8 teaspoon salt, 2 tablespoons flour and 1 cup of raisins. Add cottage cheese and mix well. Pinch off 1 inch balls from dough and press an indentation in the center of each. Put filling in. Let rise 15 minutes, then bake at 425 degrees F (220 degrees C) until golden - 12-18 minutes. The (Yas) Queen of pastries! Chef John shows us how it's done. I loved it.. My grandmother (babka) used to make these, but she omitted the raisins and used a single pitted cherry instead.. DELICIOUS! Very good but kept burning on me, luckily still tasted delicious. Pretty much a quick nut roll, not even close to the cookies my Czech Grandmas make, but still did taste good.